For courses in Foundations of Education and Introduction to Teaching. Focuses on becoming an effective teacher in challenging times. Education constantly changes—and teachers need to continue learning through professional development and educational research to improve their performance in tomorrow’s classrooms. 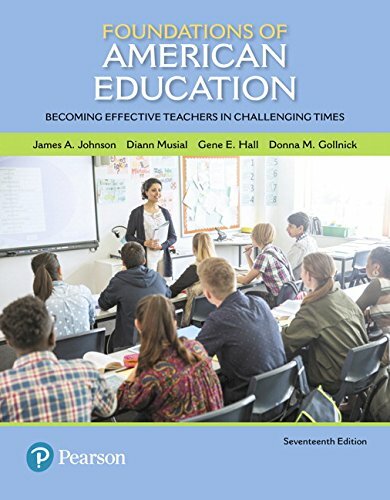 Foundations of American Education addresses the realities and challenges of teaching head on. With many new references and an emphasis on emerging trends that are impacting our schools, such as the Common Core Standards, Every Student Succeeds Act (ESSA), and social and global networking, this text encourages students to embrace new methods of instruction. Concepts are explored through current discussions of theory and practice in such critical areas as advocacy, legislation, and the current social, political, and economic climate. **The Pearson eText App is available on Google Play and in the App Store. It requires Android OS 3.1-4, a 7” or 10” tablet, or iPad iOS 5.0 or later.